During the 1930's, 40's and 50's, it was the world's busiest airport, at a time when air travel was a rare and thrilling event. Prior to O'Hare's arrival on the scene, 75-year-old Midway Airport was Chicago's aerial theater -- exciting, glamorous and challenging. 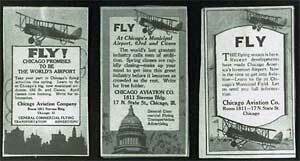 It originally opened as Chicago Municipal Airport on May 8, 1926. Almost immediately, it became a popular attraction as people flocked to watch the planes take off and land. One symbol of the airport's glamour was The Cloud Room, the popular restaurant located in the terminal and operated by Marshall Field & Company. Diners enjoyed their meals, and the floor-to-ceiling windows provided picturesque views of the field and the airplanes. No one, however, had a better view of Midway's activities than the students at Nathan Hale School, whose building sat barely 100 yards from two of the runways. When planes took off and landed, "the entire building would vibrate," remembers Robert Hill, a former student at Nathan Hale. Eventually, due to safety concerns, those two runways were closed when school was in session. Eventually, with the advent of jumbo jets (which Midway's short runways could not accommodate) and the opening of O'Hare, Midway fell on hard times. As transportation author David Young explains, "The airlines didn't want to pay for two sets of facilities, one at Midway and one at O'Hare. So in the early sixties, there was a stampede to O'Hare once the airport was fully completed." Private planes still used Midway, but over the next 17 years, the commercial airlines operations slowed and even stopped for a time. In the late 1970's, however, new federal regulations that deregulated the airline industry would inspire Midway's renaissance. Professor Perry Duis of the University of Illinois, Chicago, remembers, "They opened up routes that had been reserved for only a few carriers, and allowed airlines to reduce fares." This opened the door for new deregulated carriers such as Midway Airlines, which breathed life back into the airport. Today, Midway has grown to include eight budget carriers. Major airlines, including American and Northwest, operate there as well. And the city of Chicago is in the midst of a 722 million-dollar renovation project. While the battles continue to expand O'Hare or build a third airport, Midway's health remains robust. Midway's engaging story was told through interviews with area residents, former pilots and flight attendants, airport employees and local historians who shared their personal memories, recapturing much of the innocence and charm that characterized the airport in its heyday. The museum is celebrating its first quarter-century. "The Busiest Aviation Hub in Cyberspace"
Yes, it was thrilling watching the planes arrive and depart at Midway in its l950's heydays, but very often it was a great big pain in the neck getting to dear old Midway. I can remember how excited I was when I took my young wife and our one-year-old daughter, Ann Hampton, on our first flight out of Midway. We were headed to Pittsburgh, where my Dad would meet us and drive us back home to West Virginia. We didn't own a car in those days (l959) and so we hailed a cab not far from where we lived in the old Town and Garden Apartments in the 1400 block of North Hudson. You have to remember that this was pre-expressway Chicago. I had not allotted enough time for the trip to Midway. The cab driver made reasonably good time until we hit Ogden. The diagonal journey southwest on Ogden Avenue toward Cicero Avenue was faster than walking, but not much. It was bumper to bumper all the way on Ogden and then, of course, when we arrived at Cicero Avenue we encountered even heavier traffic, this time the usual endless, highly toxic parade of trucks. By the time we arrived, the thrill of anticipation of flying had been dampened by the stress and fatigue of a miserably memorable cab ride. Only because of delays caused by bad weather were we able to make our flight to Pittsburgh. An ironic note: in recent years, when travel to or from Midway would be complicated by construction on the Stevenson Expressway, I often found Ogden Avenue a wonderful alternative route back to the center of the city! But my most memorable moments at Midway occurred on my very first day as a reporter for CBS in Chicago -- the old combined radio and television news operation of WBBM. It was March 11, 1957. My first assignment was a tough one. The desk told me to take a camera crew and go out to Midway where I was to try to interview the then Attorney General of the United States, William P. Rogers (later Secretary of State in the Nixon administration). My assignment was to intercept Mr. Rogers as he deplaned at Midway and ask him questions on camera about the Justice Department's latest investigation into the Teamsters Union. Because the interview had not been cleared in advance with the Justice Department, and because the Attorney General wouldn't know me from Adam, I was sure that my colleagues back in the newsroom had very little expectation that I actually would be able to record the interview. I shared their skepticism. I was sure the Attorney General would walk right past me and my camera crew. Well, surprise, surprise. Not only did Attorney General Rogers stop when I greeted him coming off the plane, he took the time to answer every one of my questions! And my camera crew captured the entire interview on film. Overjoyed, I quickly gave the film to the courier who rushed back to the lab near CBS to have it processed for use in that night's Fahey Flynn l0 p.m. news. In those days, once a reporter had finished his filming of an interview, he then was expected to call into the news desk at CBS and tell them details of the story which would then be written up and given to staff announcers to read on WBBM Radio. That seems too quaint today but that's what the procedure was back then. So I called the desk and I got the crusty old bureau chief, Mike Neigoff. I could hear the skepticism in his voice when he asked, "Did you get the interview?" And I said, "Yes, sir! And he answered every one of my questions. And the film is on the way in with the courier." And so Neigoff replied, "That's great kid! Congratulations! What did the Attorney General say?" And I said, after one of the most painful pauses of my life, "I don't know, sir. I don't have a clue as to anything he said." The problem was, of course, that I was puffed up being all dressed up and accompanied by a CBS camera crew. I was representing the House of Edward R. Murrow. I was a Big Shot Reporter for CBS. I couldn't be bothered to actually listen to the Attorney General's answers. I remember Neigoff then asking me, "Kid, what did you learn from this experience?" I replied, "I guess I learned that you have to listen." "That's right, kid. You can come on in." So it was at Midway Airport in l957 that I learned the hard way the most important lesson a reporter and interviewer can learn -- when you ask a question, you'd better be prepared to listen, really listen, to the answer. Thank you and good night. In addition to Midway Airport: Crossroads of the World for Chicago Stories, Kathleen Quinn has written and produced documentaries which have aired on A&E and The History Channel. In 1998, her A&E program on heroism was awarded a silver medal from the New York Festival. Many people admire Midway Airport's shiny new terminal building and see glimpses of the future. When shooting footage at the airport for this show, my eye was drawn to the old terminal and I was transported to the past. The vivid descriptions that Chicagoans shared about the airport made me wish that I had witnessed them. From its earliest days, Midway dazzled the senses -- from the whiff of aviation fuel to the blasts of hot wind sprayed from propellers, from the roar of aircrafts' engines to the 'oohs' and 'ahhs' from the mesmerized crowds. But while images of Midway are seared in the minds of countless Chicagoans, the airport also conjured myriad personal memories. Midway was where couples went on their first date to watch the airplanes take off and land. A few of these folks even sheepishly admitted some necking went on too! Children who grew up on the southwest side made secret excursions to Midway on their bikes, despite being forbidden by their parents. The allure of Midway was too great to resist. They'd ride all around the square mile and stop along each side hoping to catch a glimpse of pilots, planes and celebrities. Midway was a place but it was also an event in and of itself. A one-year subscription to the Guide. The WTTW11 Card – your ticket to a variety of members only discounts. The great feeling of a gift that keeps giving. The Greeks in Chicago: Opa!